DSL stats can be configured to monitor traffic. I find it (MSWS) useful, as someone who struggles to interpret raw modem stats, because of the graphical presentation, that exposes puzzling phenomena. It's an educational tool. DSLstats does show nice graphs of many parameters. I'm curious as to what you mean by "traffic". It seems almost a philosophical question. How might that be conjured out of raw modem data, with no knowledge of higher-level protocols? It seems to that if that is a measurable quantity, it can only be something upstream routers could, er, guess at. I wonder (and would like to know, genuinely) how ISPs that impose traffic limits measure it. For me, DSLstats stats shows a graph of Traffic up and down in KB/min. My Zyxel VMG8924-B10A router does have counters which I can see on its GUI. Donating allows you to increase the graph size also. I don't think I could go back to using the smaller graphs now. I also find it useful to be able to look at my home/work & brothers connections, I make a donation every year. A lot of work and hours, not to mention money goes into keeping it running. The same goes for the Kitz forum/website which I also donate to. Hi all! Long time lurker, first time poster! Now just need to wait an age for DLM to restore my speeds, caused by damn flaky Asus firmware! How does MDWS identify your ISP. I'm currently with Aquiss so my ISP is Entanet owned, yet it is showing as Talk Talk in the All Users view. Is this something I have configured or is MDWS using the IP address to tray and work out which ISP you are with? Reckon so. 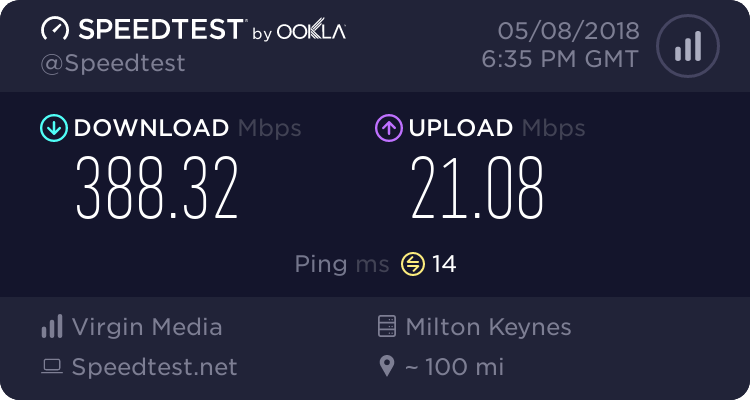 Migrated to IDNet overnight and MDWS has picked up that change OK.
Just slightly bemused why an IP address for Aquiss that comes out of an Entanet block was showing as TalkTalk. Thanks for the confirmation, Tony. There was certainly a large gap in my uploads. Because I am uploading using a Docker VM on a Mac, I don't tend to run it after a machine restart unless I consciously want to track what's happening with my connection. I was on a Pulse8 TTB connection until a month ago, so the TT reference must have been from prior uploads. I did start uploading again from the early hours on the 3rd December and had what looks to be an interrupted upload for 3.5 days. I have had some technical issues with Kitematic since Friday, which I only spotted yesterday evening, which will explain a further restart of the upload yesterday. Has the server just been restarted? Something must have restarted because although I didn't have dslstats running during the day yesterday (I started it after your blip), at 19:51:39 I was sent an email to say I hadn't been uploading since 00:20:37 when I shut down the previous night (I have it set to not repeat the emails). I want to register another line in a different location with MDWS, now that it has something monitorable rather than a HH5. No matter what variations of real name, user name, email address etc that I tried, I get "You already have an existing registration on MDWS! ".